The Dollar Index remains in positive territory but remains cautious amidst the prolonged and contentious government shutdown. NYMEX WTI Crude spiked 2.50% to trade near $52.00 a barrel. The stage is set in the House of Commons for the “meaningful vote” with proposed EU Withdrawal Agreement expected to fail. The GBP/USD is trading lower and cautiously. We expect volatility to increase as the outcome is announced. More importantly, investors hope to have clarity on the next steps with different scenarios at play. PM May has called for her parliamentarian colleagues to support the Brexit separation agreement and not "let the British people down." Voting is expected at around 19:00 GMT/7:00 PM London time. According to the BBC, there are a few "backbench amendments to be voted on that could potentially reshape the deal and then the vote on the withdrawal agreement will take place. The greenback, measured by the US Dollar Index, is trading near a four-day high vis a vis other G-10 currencies. There is little macro data in the docket today with major moves expected in the pound and crosses as the UK Parliament holds its “meaningful vote.” Prime Minister May’s plan is widely expected to be rejected, but the extent of the defeat and ensuing chaos are likely to inject volatility. Meanwhile, commodity currencies are trading higher after China announced tax cuts to support its slowing economy. WTI is up 1.35%, and gold is trading higher, close to $1300 an ounce. The partial government shutdown continues in the US, and therefore political risk remains a live issue for the greenback. 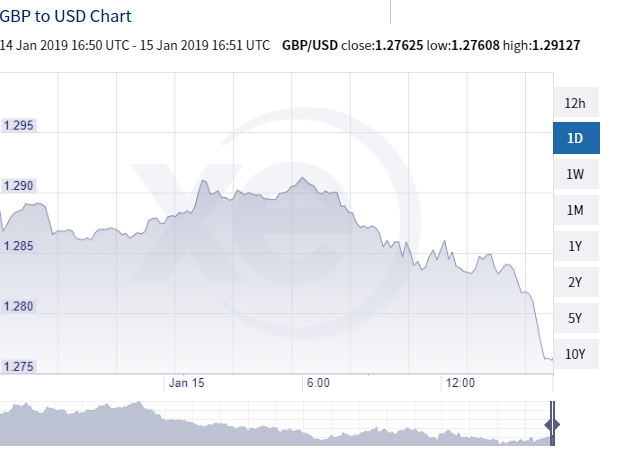 GBP/USD is sliding lower as market watchers turn their attention to the vote on the EU Withdrawal plan in the UK parliament. PM May’s Brexit deal is facing a nearly-certain defeat. Investors are likely to face more uncertainties in the aftermath of the vote with several scenarios at play. We expect the pair to hold around current levels. EUR/USD is pointing lower this morning after erasing yesterday’s tiny gains. The market awaits ECB President Draghi's scheduled testimony before the European Parliament. The Old Continent is recording sluggish growth and recent data has not been encouraging. The Central Bank meets on the 24th of the month and is widely expected to hold its rates unchanged. The Canadian dollar is advancing against the US dollar for the first time in four days, supported by an uptick in WTI. Crude oil futures are trading higher around $51.25 a barrel, halting a two-day slide. Global benchmark oil prices have been about 25% lower than assumed in the last MPR report from the Bank of Canada, and have had significant impact on the Canadian outlook. USD CAD is expected to trade along general market sentiment in the absence of any impactful data releases. AUD/USD is oscillating around 0.7200, near the upper range of the day following encouraging steps from Chinese officials. China just announced tax cuts to boost its flagging economy, which sent proxy currencies higher. USD/JPY remains in consolidation mode around the mid-point of 108. Earlier today, Japan released its preliminary December Machine Tool Orders, which dropped by 18.3% year over year. The Yen is soft after Chinese authorities announced more stimulus packages to support its economy and allay fears of a global slowdown. Political risks from the US and UK are still live and will encourage flows into safe-haven assets.